However a couple of years later himself and like-minded Crass fanatic vocalist Deko Dachau founded the now legendary and seminal punk pack band Paranoid Visions . Having played and consistently released new material for over 30 years, the band reached a critical and commercial peak in 2012 managing to hit the top ten in the Irish charts with two singles and having the subsequent album ‘Escape From The Austerity Complex’ being hailed as: "the best punk rock album in years"
Inspired by the results and the overwhelming reaction to both tracks Steve Ignorant and Paranoid Visions decided to record an album of similar material. The result is ‘When...?’, a hybrid of styles, all with a nod to early 80s anarcho-punk (the LP version is enclosed in a beautiful Crass style sleeve). 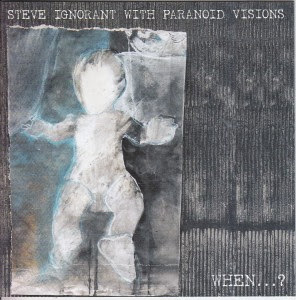 Recorded over a few months in the bands own FOAD studios, Steve was recorded in the manner that he likes best, ("a bit like recording Stations... Get in, get it done, get out before closing time") and the results retain that frantic aggression and power whilst retaining Paranoid Visions' anthemic trademarks. Already described as "the best stuff Steve's been involved with since side one of Christ the album" and "like Flux playing UK Subs songs", it’s an album that deserves a listen from anyone with a passing interest in the genre.